The crescent moon lit up by earthshine was captured by astrophotographer John Chumack on Sept. 8, 2015. As the sun sets, our own planet can light up the moon and produce an ashen glow. 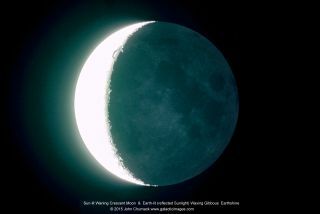 The crescent moon lit up by earthshine was captured by astrophotographer John Chumack on Sept. 8. "That pale glow on the unlit part of a crescent moon is light reflected from Earth, also known as earthshine," Chumack wrote in an email to Space.com. When sunlight reflects off the Earth and shines onto the moon, the phenomenon is called "earthshine." A crescent moon is between a new moon and a half moon. The sunlit portion is a waning crescent moon, and the Earth lit portion is a waxing gibbous earthshine. Chumack used a Canon 6D DSLR & 8 Inch Diameter F10 SCT(2000mm FL), ISO 400, 1.6 second exposure. Editor's note: If you capture an amazing image of the night sky that you would like to share with Space.com and its news partners for a story or photo gallery, send photos and comments in to: spacephotos@space.com. Follow Space.com for the latest in space science and exploration news on Twitter @Spacedotcom and on Facebook. Original story on Space.com.